Imphal, November 15, 2017 (DIPR): Hon’ble Governor of Manipur Dr. Najma Heptulla said that the land of Manipur is very fertile not only in biodiversity but for future development of the youths which is why she is totally involved with the young children and youths of the state. She stated this while inaugurating the 2-Day National Conference on ‘Promoting Business Opportunities in North Eastern India and India’s Act East Policy’, to be held on 15th and 16th November, 2017, today, at the Centenary Hall of Manipur University organized by the Manipur Institute of Management Studies, Manipur University in collaboration with Centre for Global Management and Responsible Leadership, XLRI, Jamshedpur. Hon’ble Governor Dr. Najma Heptulla addressing the gathering said that the Hon’ble Prime Minister of India is sincerely concerned about the issue of backwardness in the NE region. His look east policy also includes work east policy. Clarifying on the notion that the government has never been bothered about the NE Region, she said the problem is the distance (accessibility) from the rest of the country. Dr. Najma Heptulla said after taking charge of the State her first suggestion was to improve the conditions in the hill region as many areas lack basic infrastructures including medical facilities. Due to difficult terrains, doctors and medical staffs are unable to provide even the basic medical facilities. Villagers residing in remote areas are also unable to reach to the nearest medical facility due to lack of transport facilities including bad road conditions. Deeply concerned about the issue, the Governor requested the Prime Minister for ‘flying doctors’ to treat the people. The Prime Minister and NE council accepted the allocation of fund for flying doctors. She said that she is pleased to learn that since its inception in the year 1995, the Manipur Institute of Management Studies has been imparting management education in the region and striving for growth with quality. She said that she is happy to learn that the Institute is focussing on the quality of the young minds, reminding of her late grandfather, the first Education Minister who laid the foundation of quality education in the country. 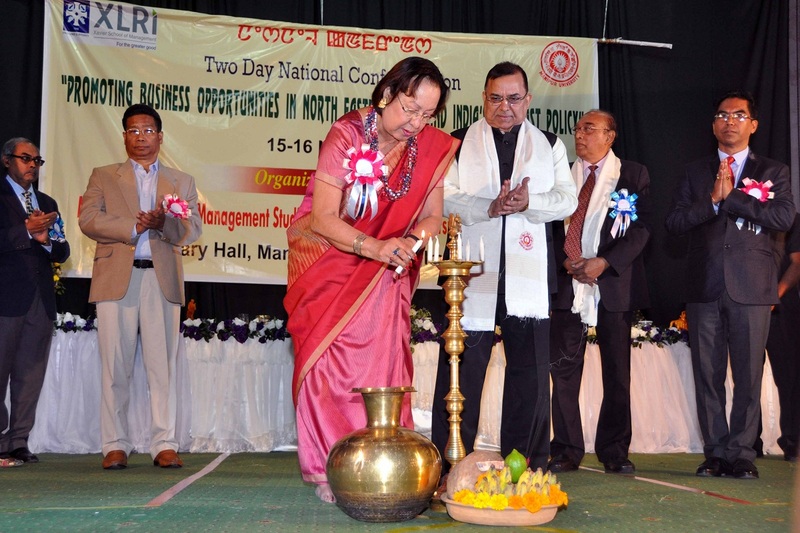 She said the Manipur Institute of Management Studies is a fast growing Institute with a mission to instill potential and practicing managers with analytical skills, leadership qualities, achievement motives and a vision, all so crucial to the steering of enterprises. She expressed her belief that policy makers, researchers and practitioners from different parts of the country participating in the Conference will explore ways and means to promote business opportunities in the North Eastern States. The abundance of natural resources in the region presents a huge investment opportunities and growth of enterprise in the region. However, the region is facing innumerable challenges like sustained conflicts, geographical isolation, militarization and migration, lack of economic and social development which has led to a drying up of industries and investments in the region. The Act East Policy of the Government of India is opening up many opportunities in this part of the country. Apart from the commitment of the Central and State Government, the capacity building needs of the people in the region have to be acknowledged and addressed. After discussion with Hon’ble Prime Minister on skill development called the Livelihood Programme, Workshop on skill development has been organized at the Raj Bhavan, Imphal in collaboration with the Central Ministry. She also announced that a livelihood mission project has been approved by the State Government which will be launched soon. Manipur is a powerhouse of energy and have enough people to be developed and trained in small scale industries in organic farming. We can really develop a large scale of export of the products. Of late, great initiatives have also been taken up by the Government of India with regard to the Act East Policy which includes tri-lateral highways passing through Imphal and connecting to ASEAN countries, railway lines up to the border town of Manipur, bilateral and multilateral agreements with the ASEAN member countries, trade negotiations and many more. However, few issues and challenges too need to be focused and they are law and order, political will, internal conflicts, physical infrastructure like road, telecommunication, banking and so on, she added. Terming the conference as a platform for policy makers, researchers and practitioners to present their understanding on how business opportunities can be promoted in the region she said she is fully confident that the practitioners and experts will present papers for deliberation on how business opportunities could be promoted in the region. She also said that she would like to look up the recommendations of the conference which could be beneficial for the development of the state. Prof. Adya Prasad Pandey, Vice Chancellor, Manipur University; Prof. N. Lokendra Singh, Dean, School of Social Sciences, Manipur University; Prof. P. Venugopal, Chairperson, CGMRL, XLRI, Jamshedpur; Mr. Nakib Ahmed, Advisor, NE Initiative, Indian Chamber of Commerce, Kolkata; Prof. Ch. Ibohal Meitei, Director, MIMS, Manipur University, delegates, entrepreneurs of the state and students attended the inaugural ceremony.